System Protection is yet another means of backing up important system files. Unlike either of the previous methods, it doesn't require or use any external disks. Nor does it back up any installed programs or all of Windows 7. Rather, it maintains copies of the most important system files needed for Windows 7 to operate properly, as well as hidden shadow copies of some of your own personal files. The idea behind System Protection isn't to protect you from rare catastrophic hard drive disasters; it's to protect you from smaller and much more common mishaps. For example, you install some program or device that wasn't really designed for Windows 7, on the grounds that "It worked fine in XP so it should work fine here," only to discover that it doesn't work as well as you assumed it would (because it wasn't designed for Windows 7). Even after uninstalling the program, you find that some Windows 7 features don't work like they did before you got the notion to give the old program or device a try. Another common mishap is when you make some changes to an important file, only they're not particularly good changes. But you save the changes anyway out of habit, thereby losing the original good copy of the file you started with. Sometimes System Protection can even help you recover a file that you deleted and removed from the Recycle Bin. If you have documents on other hard drives, you can extend System Protection to protect documents on those drives, too. However, it would be best not to try to use System Protection to protect a hard drive that has another operating system installed on it, like Windows XP. Windows XP has its own System Restore feature. Click the Start button, right-click Computer, and choose Properties. Click the Start button, type sys, and click System. Click the Start button and choose Control Panel => System and Security => System. In the left pane of your System folder, click System Protection. The System Properties dialog box opens to the System Protection tab as in Figure 1. To ensure that system protection for Windows 7 and user account files is turned on, first look in the Protection Settings box to verify that the Protection column shows "On" for your system disk (typically Drive C:). If the Protection column indicates that protection is off, click the Configure button to open the System Protection dialog box. Then, choose one of the first two settings in the Restore Settings group. You can also specify how much disk space to allocate to system protection with the Max Usage slider. 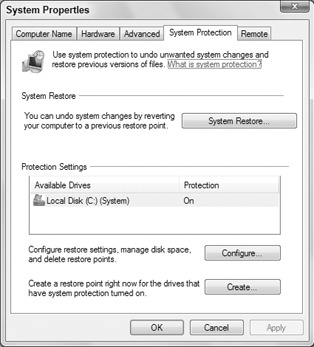 Note that if you turn off System Protection, all existing restore points are deleted. If your computer contains other volumes, whether you apply System Protection to them depends on what is on the volumes and whether you find it worthwhile to enable system protection on them. After you've made your selections, click OK. You're done. Nothing will happen immediately, but Windows 7 will create restore points every 24 hours. Each restore point contains copies of your important system files, and shadow copies of files on the volumes you specified. System Protection needs a minimum of 300 MB of space on each protected volume for restore points. If necessary it will use from 3 to 5 percent of the total drive capacity. It won't grow indefinitely or consume a significant amount of disk space. Instead it will delete old restore points before creating new ones. Old restore points are of dubious value anyway. Figure 1. System Protection tab in System Properties.